Tuning hammers for tuners are like bats for baseball players: the smallest difference in weight, leverage, or shape is significant. The way the socket fits on the pin (how the diameter taper profile of the socket matches that of the tuning pin) matters greatly. Significant variations in tuning pin sizes and shapes exists between sets. In 1885, Francis Hale introduced the interchangeable tuning pin tip (rather than the previous necessity for changing out the entire tuning lever head) to accommodate this. Length and angle of the head in relation to the shaft is also important. Tuning hammers are the tool that piano technicians pick up the most often; it is used for tuning, stringing, and in voicing the piano. Because of this, tuners develop a sensitivity to the lever and pin, and can have an awareness of the subtle differences that distinguish one tuning hammer from another. 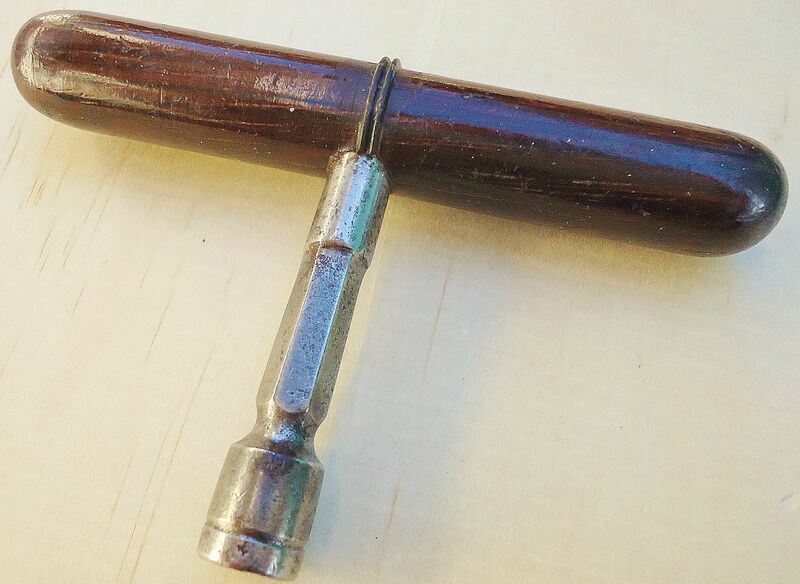 Early tuning tools were in the form of a “T”, with a striker on one or both ends of the handle, for the purpose of driving the tuning pins into the pinblock (or wrestplank), done in the process of string replacement. This illustration is one of the earliest depictions of a tuning hammer that I have found, drawn by Father Mersenne (“L’Harmonie Universelle”) in 1637. The instrument is basically a Flemish style harpsichord. 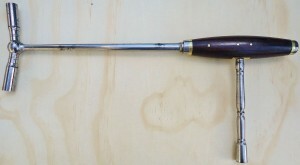 Note the hook on the top of the handle, which was for making the braids and loops on the hitch pin end of the string, opposite from the tuning pin. 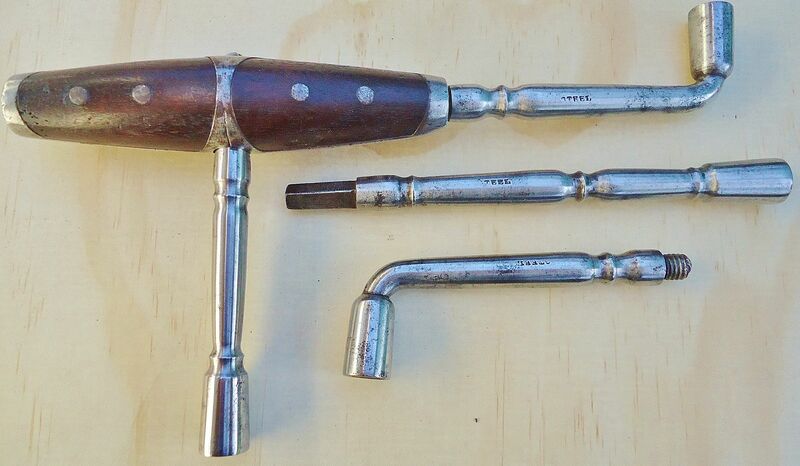 Some “T” shaped pre-1860 tuning tools had this additional hammer function; while modern tuning tools are actually long single levers, the use of the term, tuning hammer, was retained. 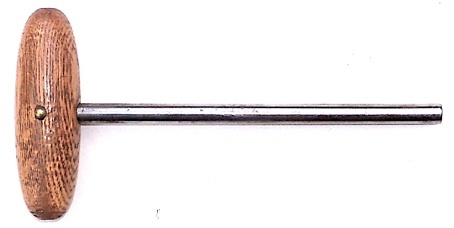 Here is a tuning hammer for an early fortepiano or harpsichord, which was found in England. The width of the oblong socket is 4 mm. Early tuning hammer with stringing hook. These tools were typically provided with the instruments at purchase, along with a small supply of strings. There was no standardization of tuning pin size at the time, which is why the socket was tapered. Stringing hooks were often removable, and were used for making the loop and braided end of the single strings on these early keyboard instruments. Thanks to Ed Swenson for the help in identifying this tool. 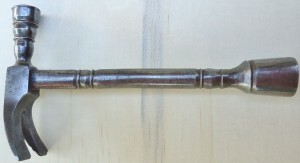 The National Music Museum at the University of South Dakota has an interesting collection of early tuning hammers, some are similar to this one. Early 19th century British hammer. A number of these have surfaced over the years. 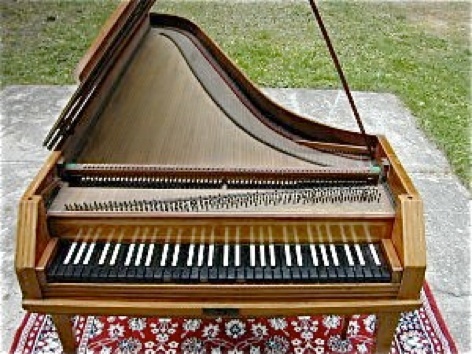 Late eighteenth century fortepiano, attributed to Dulken and restored by Ed Swenson. Photo from philharmonia.org. 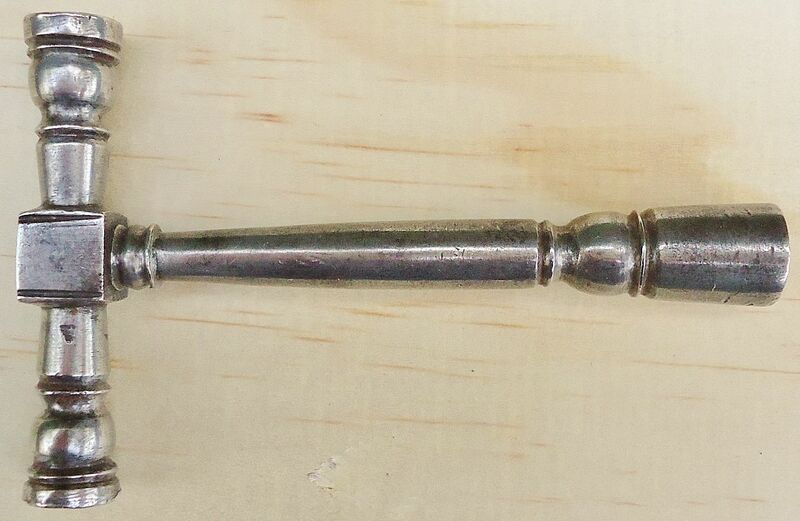 Very small 1840 Broadwood tuning key and tuning pin; later 19th century pin and its appropriate tuning hammer. (photo by “weeT” in the pianoworld.com forum). 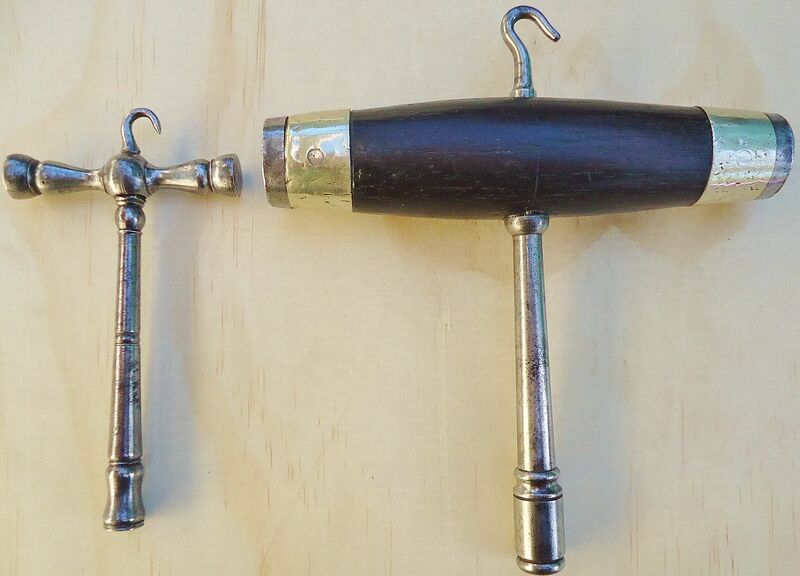 Two small, early hammers, both rosewood, with one striker each. A Stanley ruler, 6” with 2” extension is in the background. 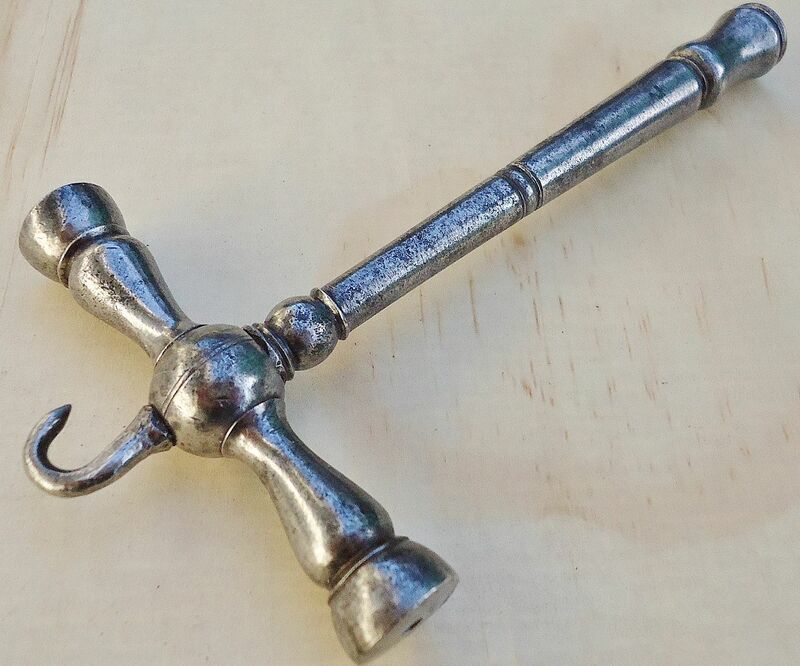 The hammer with a string hook, from the Eastern U.S., has a 5.5 X 7 mm. 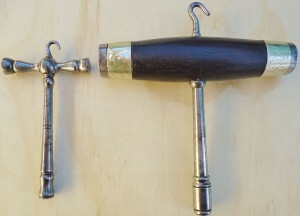 oblong socket , and the hammer on the right was found in England, and it has a square 5.5 mm. socket. 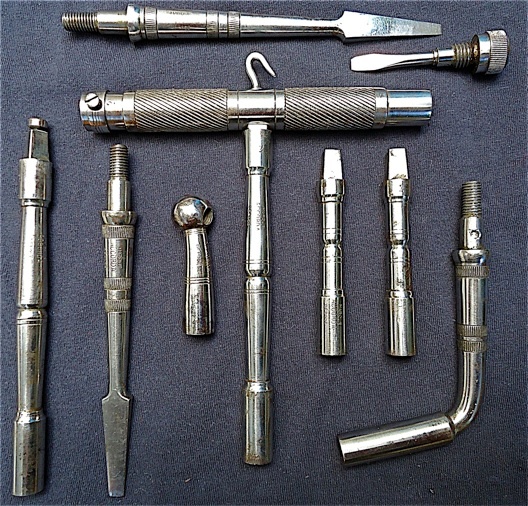 Degree of taper in the sockets of these antique hammers vary, which is another factor for the size of the socket. Some are not tapered. The old tuning pins were much smaller and had a rectangular or oval top. There was no standardization, and the pin size and shape could vary. 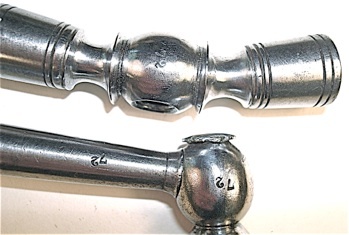 Paul Poletti wrote a very good article, Tuning pins: Modern, antique, or “historical”? 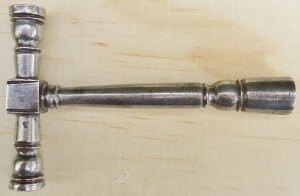 Early ornate tuning hammer, with a tapered 5 X 7 mm. socket. 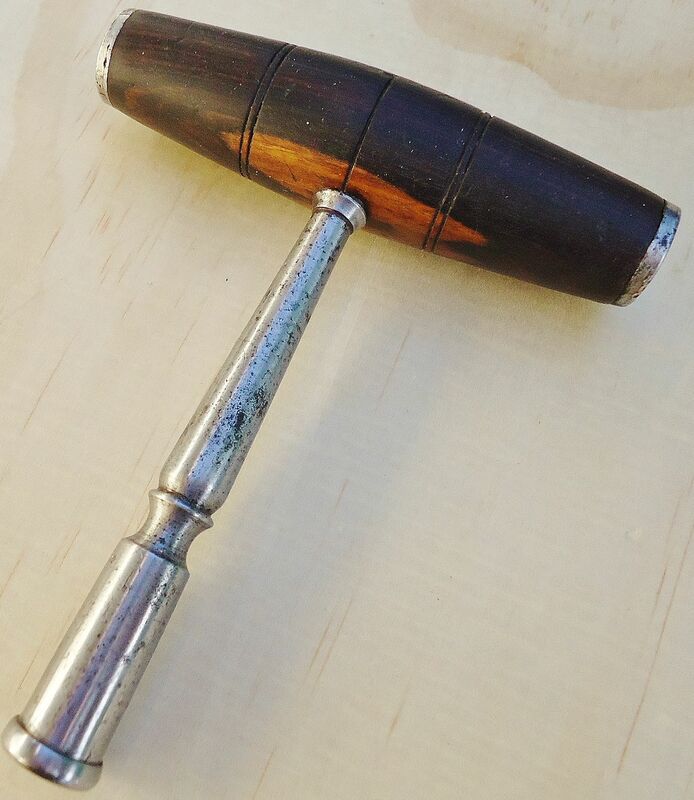 Harpsichord tuning hammer. David Stanley auction, Sept., 2017. Ivory handles and faceted shafts. Faceted shaft and turned handle. 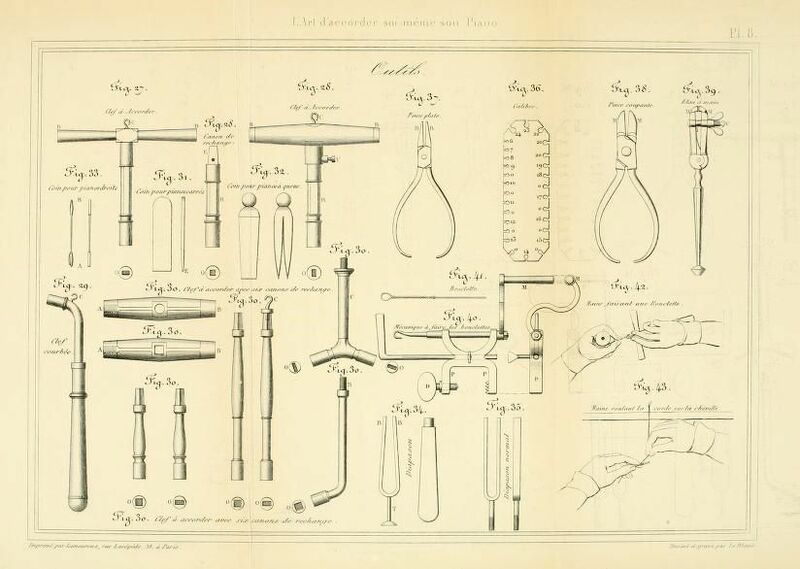 A depiction of equipment for tuning the piano, from L’Art d’accorder soi-meme Son Piano: Une method sure, simple et facile, deduite des principles exacts de acoustique et de l’harmonie, written by Claude Montal, a French piano tuner, and later, manufacturer, in 1836 (1865 edition.) 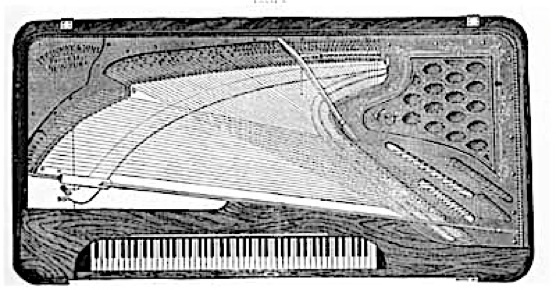 I first saw this illustration in Keynotes: Two Centuries of Piano Design (New York: Metropolitan Museum of Art, 1985), written by Laurence Libin, an exhibition of 70 pianos from Cristofori to the late 19th century; May 29–November 29, 1985. Leon Pinet, Paris: Universal tuning hammer. Victorian-styled universal tuning hammer, from England. This was carried in J. & J. Goddard’s trade lists for many years. Weygandt und Klein, Stuttgart, Germany, and Alfred Dolge New York City, U.S.A. 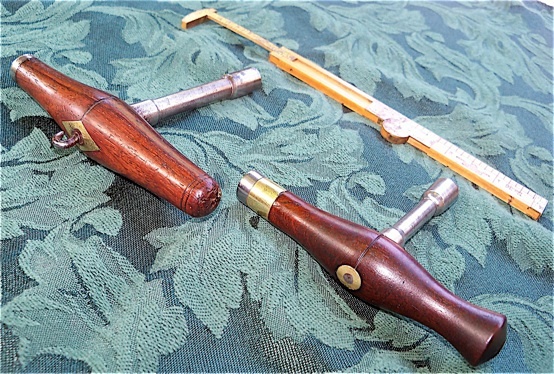 Very old French tuning lever, with a beautifully turned rosewood handle, similar in shape to the clef courbe’ shown in the Montal illustration above. This one is 9-3/4” long. As the 19th century progressed, pianos became larger, heavier, with greater string tension, and some of the tools grew in size as well. Tuning pins of the 19th century square piano were situated in the back of the case, which means the tuner is required to bend over most of the width of the instrument in order to reach the tuning pins. Long extensions of the tuning hammer helped make this less challenging. 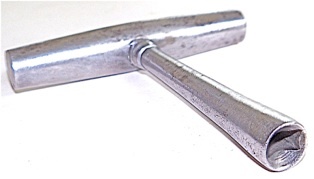 This is another universal tuning hammer, which can be used either as a T hammer or as a long (16″) tuning lever. Since the square (and other early pianos) had oblong tuning pins, there are only two tuning positions available. 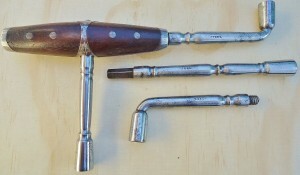 The tuning head with two sockets at 90 degrees made four positions possible. This was called the double oblong head. Even so, the room to work was limited, so some of the tuning would be done with the T hammer, which offered little leverage but enabled the tuner to work within a confined area of the piano. This photo includes both the T tube as well as the lever extension for demonstration purposes. Attachments are used separately. Steinway square piano with tuning pins near the back of the case. 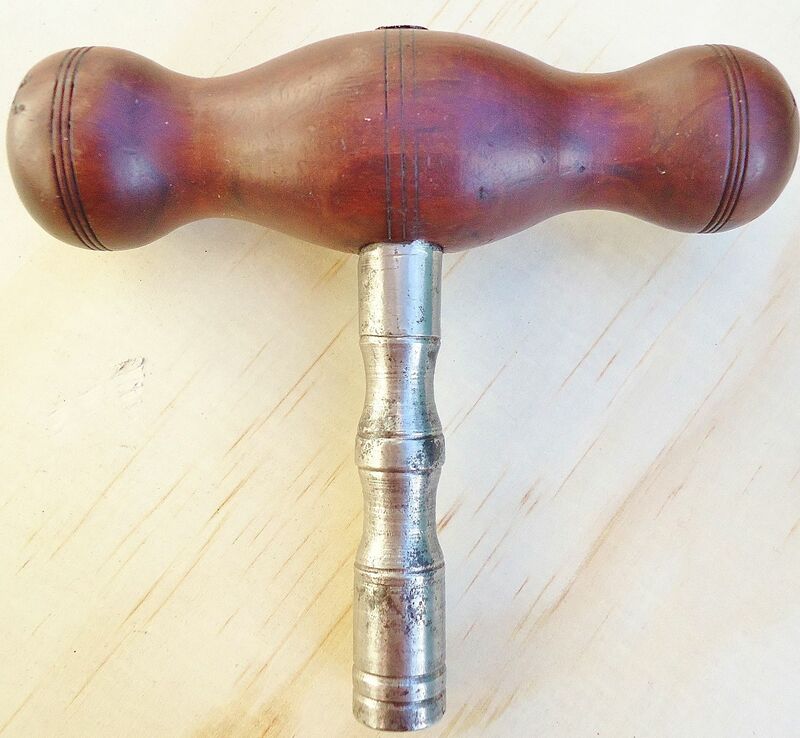 Chickering and Sons double tuning hammer. Close-up showing the Chickering name engraved into the German-silver ferrule. Chickering was established in 1823, and was the first recognized piano manufacturer to produce a full iron frame in a grand piano, circa 1843. The factory that they built in 1852 on Tremont Street in Boston became the second-largest building in the United States at the time, and the building featured some of the most advanced steam powered machinery available. Chickering pianos were often considered the American piano industry leader until the 1870s, earning the endorsements of many virtuosi of the day, including Franz Liszt. 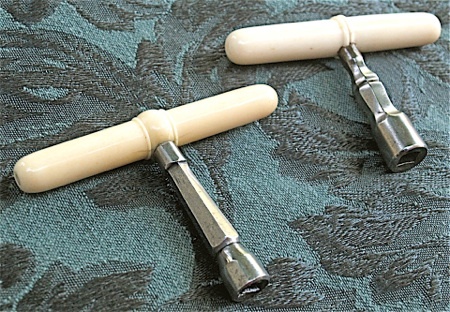 When Mason & Hamlin in Boston decided to add pianos to their established production of harmoniums in 1883, they introduced a new design of tuning hardware known as the “screw stringer.” In their pianos, the screw stringer design eliminated the pinblock with tuning pins, which has been the established standard since the beginning of stringed keyboard instruments to the present day. It was an attempt to eliminate the tuner’s challenging task of manipulating the tuning pin with its inherent twisting and bending while tuning. The screw stringer did achieve this goal, but did not resolve issues surrounding rendering the string through its termination points: the pressure bar and bridges. This design was partially successful, and it is still possible to tune some of these old screw stringers. 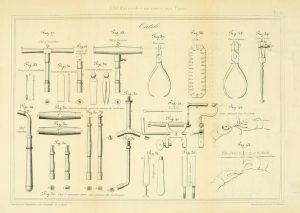 Other similar alternative tuning hardware was developed concurrently by Brinsmead (the “Top Tuner” ) in England and, to a very limited extent, Ivers and Pond, also in Boston. Mason & Hamlin continued production of the screw stringer until as late as 1905. Additional alternative tuning arrangements included the tuning pins fastened directly into the iron piano plate instead of into a wood pinblock, which did not require proprietary tuning tools. 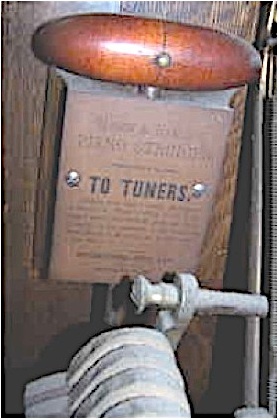 Examples of this tuning arrangement include the Wegman “Tuning Pin Fastener” (c. 1890–95, Auburn, NY), Wurlitzer “Uniplate” (c. 1926, North Tonawanda, NY), and the “Beale-Vader Tuning System” (c. 1902, Sydney Australia). Broadwood and Sons, in London, introduced “The Threaded Wrest Pin” c. 1862, where the pin is threaded into the tapped holes of the metal plate above a friction fit into a more traditional wrestplank underneath the plate. Fortunately, these pianos included a warning sign for the tuner about this! Inside a Mason & Hamlin upright. This is the version of the Mason & Hamlin tuning key that was intended for the grand pianos, but both tools could be used on either piano. This is another old lever style. 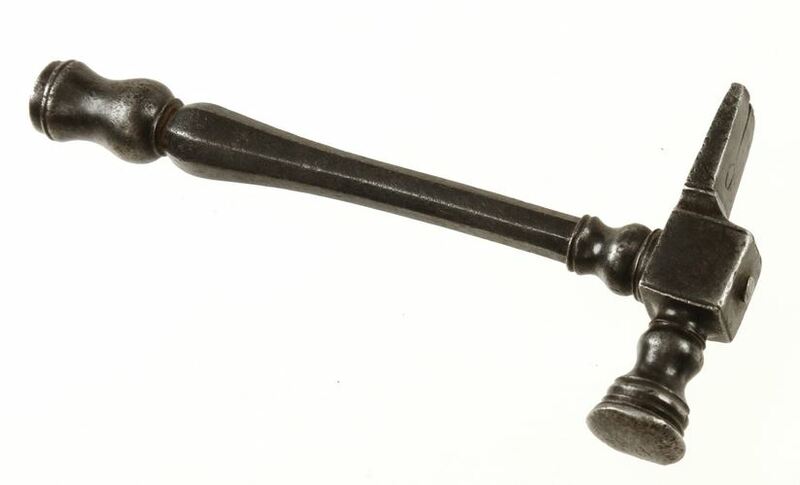 Here is a fairly similarly shaped design to the lever above–it was found among the US patents. 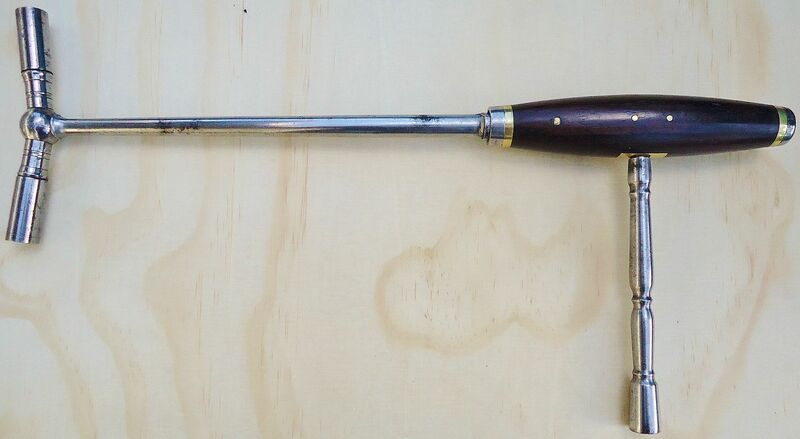 It has the same basic shape as the preceding tool, with a metal cap, or striker, at the end of the handle, and a long metal sheath at the business end. There is no shaft and the head is directly attached to the heavy ferrule at the front of the handle. This patent is for a rotating square socket with a clutch feature that allows for many tuning positions more than the four possible with a fixed square socket. A star shaped socket became fairly available no more than ten years after this patent. Nevertheless, designs for a rotating ratchet-like square socket can be seen in the US patents as late as the WWI era. 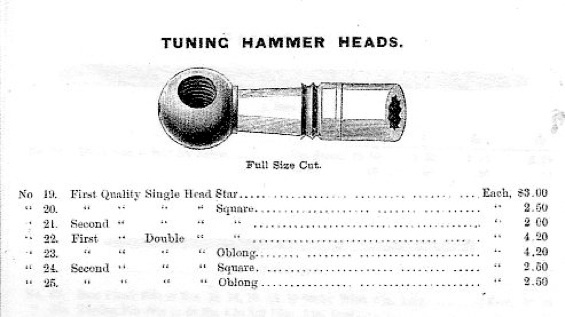 This next list of tuning hammer heads was offered in the 1885 Hammacher Schlemmer piano supply catalog. 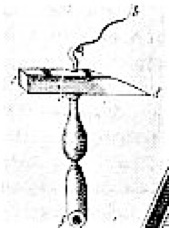 A star tuning socket can also be seen in an early 1885 Hale patent. 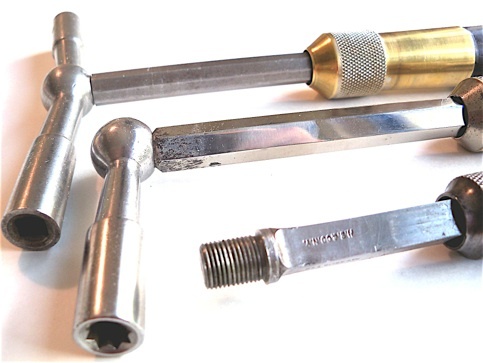 The star tip made eight tuning positions available with the square tuning pin. 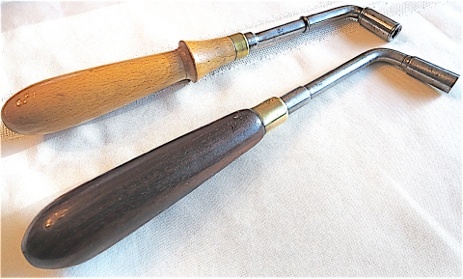 “Stimmhammer,” or German hammer; the beech handle will accept modern Renner type stems. This example, marked “Germany,” was probably made between the 1900s to the ’20s. The rosewood hammer has “STEEL” marked on the shaft and has an oblong socket. It was made by Richard Reynolds of 4 Upper Rathbone Place in London in the 1870s or ’80s. 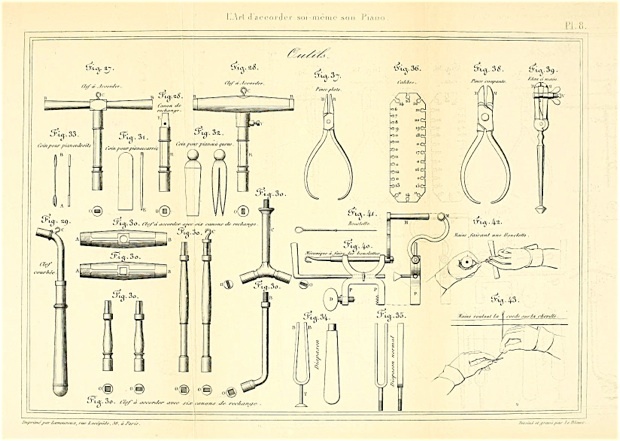 Reynold was the most prominent maker of specialized piano tools in England in the second half of the 19th century. More can be found on Reynolds here. Curved shafts, known as a “gooseneck shaft” in North America, were used extensively in England, Germany, and France. Hammers with this feature are considered student models at best in North America, but were used in the past for some serious tuning in Europe. The piano industry in Continental Europe and Great Britain primarily utilized various species of beechwood for their piano wrestplanks as well as some other general structural components. Traditionally built wrestplanks made of beech, typically yielded significantly lower tuning pin torque than the hard rock maple sourced from America. American piano makers universally used layers of hard rock maple for their pinblocks, which could potentially yield a tuning pin torque as much as 150 inch pounds. Hard rock maple has a higher performance under compression than beech–from the driven tuning pin. European tuners and stringers did not need the extra leverage and robustly constructed tuning hammers that the Americans required. “Bluthner pattern” tuning hammer, made by Weygandt und Klein of Stuttgart, Germany. Characteristics include the bend in the shaft directly above the tuning pin tip, and a thickening of the shaft diameter as it enters the handle.